The Omaha chapter hosted a donation drive to benefit Heartland Family Services, a local organization with a mission to strengthen individuals and families in the community through education, counseling, and support services. Heartland provides emergency shelter for women leaving domestic abuse situations. 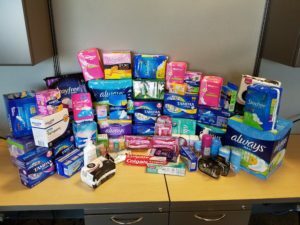 WLN Omaha organized a drive to collect feminine hygiene products for them. Attendees were asked to bring something for their donation, but we also had items given by people who could not attend. Founded in 1875, Heartland Family Service serves more than 52,000 individuals of all ages each year from more than 15 locations in east central Nebraska and southwest Iowa. Their programs provide critical human services to the individuals and families who ultimately shape the future of our community in the following focus areas: Child & Family Well-Being, Counseling & Prevention, and Housing, Safety, & Financial Stability.